ARNOLD – THE FIRST AND THE LAST FOOTAGE. 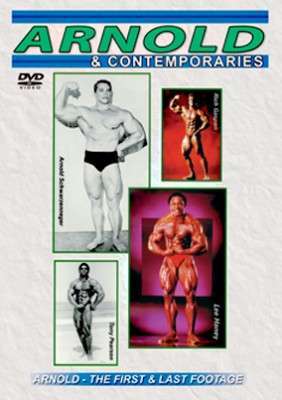 This is a DVD that features Arnold and some of his friends and contemporaries as well as many stars who followed soon after Arnold. Featuring rare new footage of Arnold at the 1966 NABBA Universe. This was his first Universe appearance as a very young bodybuilder. ARNOLD – THE FIRST AND THE LAST BODYBUILDING FOOTAGE. This is a DVD that features Arnold and some of his friends and contemporaries as well as many stars who followed soon after Arnold. Featuring rare new footage of Arnold at the 1966 NABBA Universe. This was his first Universe appearance as a very young bodybuilder. Then the last public bodybuilding Expo appearance in Europe that we have of Arnold on video – as a movie super-star at FIBO ’93. (The total time of Arnold on this DVD is approx. 15 mins). Special thanks to Willy Zdenek of SVH for the use of this 1993 FIBO footage. There is relatively little footage available on DVD of some of these stars you will see from the 80s and early 90s – namely Strydom, Hensel, Moller, Hill, Valente, Jablonicky, Wilcosz and Pastel. All had fantastic physiques and deserve to be better recorded for posterity. This is our visual tribute to these great bodybuilders! Special Note: John Citrone is a true early contemporary of Arnold having competed against him as a class winner at the NABBA Universe in the 60s. Arnold is still seen on stage at the Arnold Classic each year in Columbus, Ohio. The whole event is now known as The Arnold Sports Festival.